Genuine Fender® SuperStrat Tortoise Shell, 4 ply, standard 11 hole pickguard for 3 single coil pickups. These are the same pickguards installed in the Deluxe Player Strat, they have the small hole in the lower tone control region for the extra push-push button switch. This pickguard is fully shielded with aluminum foil. Tortoise shell pickguards are subject to warping and shrinkage, it is a characteristic of the celluloid and vinyl layering. Here is a link to an informative article provided by Fender all about the Tortoise Shell material. Tortoise shell is prone to pitting scattered across the entire surface, this is a characteristic we have seen for as long as we've worked with Tortoise shell and is not something we consider as defect since it is found on every Tortoise shell pickguard we receive from Fender. Fender has cut away a small rectangular area of the aluminum foil around the switch hole and scribed the bare pickguard material to facilitate better adhesion of the switch mounting block to the pickguard. The switch mounting block is to be glued to the pickguard with a strong epoxy type adhesive. 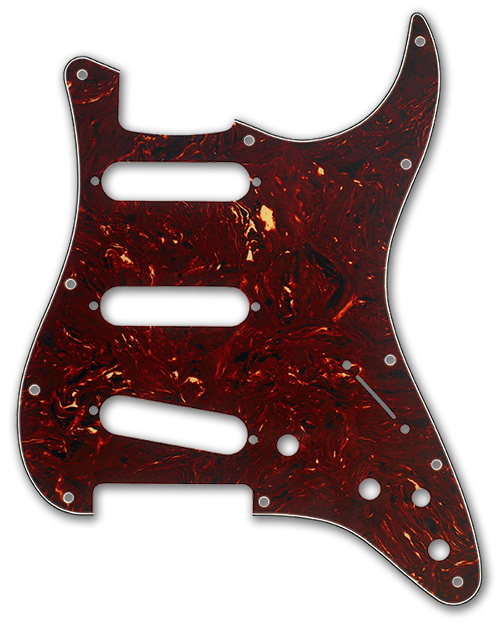 No additional components are supplied with this item purchase, it is for the pickguard only. Related components listed below. BUT DON'T WORRY... We can modify any Genuine Fender Strat pickguard with the small hole for this push-push switching system along with the permanent mounting of the switch mounting block. We have all the components for this switching system. We can create one of these pickguards from any of our various models of Fender pickguards we have in stock, we can even create one using our custom manufactured black or white Acrylic pickguards that have the rounded and polished edge. Shoot us an email with your pickguard choice and we'll let you know the cost, but typically your cost will be $20.00 additional to the normal cost of the pickguard you choose. This $20.00 additional covers the cost of the $11.00 switch mounting block and a small $9.00 labor charge to create this custom pickguard for you. Here is a link to an informative article provided by Fender all about the Tortoise Shell material. 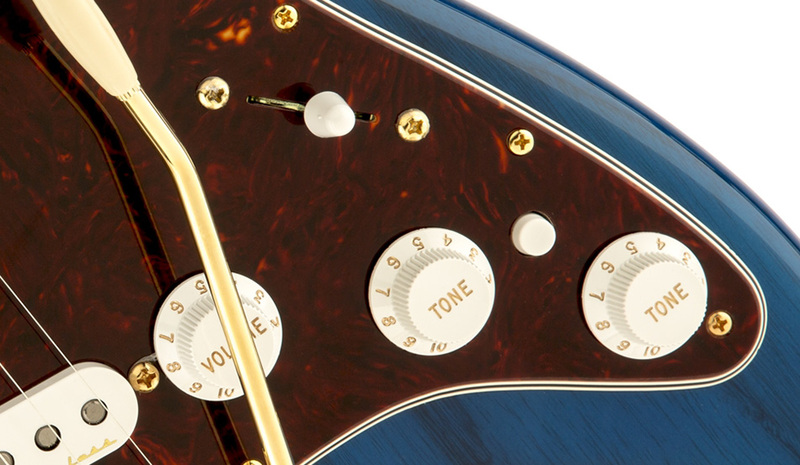 Close-up depiction of the push-push button as installed in a complete Deluxe Player Strat®.